Many times in the creative process we can stifle our inner muse if we try to edit too soon. If in addition to enjoying creating new things, you are also a perfectionist, the NEED to fix things as you write or compose or create can become overwhelming. The need to correct and fix seems to inhibit the forward motion of completion because we can ALWAYS improve what was just created. The best writers recommend not making any edits prior to finishing a first draft. Get the words on the paper and finish before you begin thinking about all the things you've done wrong - spelling, grammar, and plot included. This is easier said than done! The desire to fix as we write stymies our creative process. Waiting to edit until the creation is complete is valuable advice for not only the writer, but the composer, the scupltor, etc. Once the work is complete, you can then begin the editing process. Really the editing process is extensive and requires numerous pass throughs. As you can see there are multiple edits, and many editors would likely include more types of editing with greater nuances of what they entail. Finding a good editor is key to landing not only an agent to represent your work but also that elusive book deal! I like to start with grammar and spelling reviews with MS Word. I then run my writing through the paces with other software programs like Grammarly and ProWriting Aid. I have really enjoyed the ProWriting Aid over the last month. 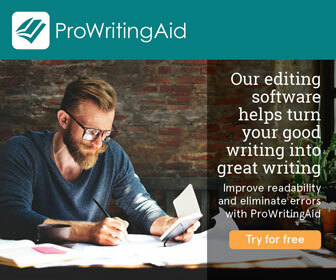 They offer a free two week trial, but my favorite feature is not only receiving the punctuation and spelling help, they also grade sentences on ease of reading, style, and length of sentences. Another important feature is the ability to change my audience. Am I writing to business professionals or is it perhaps a more casual "conversation tone?" Because the edits have proven so helpful I have converted to a paying customer. If you would like to know more - just click below to start a free trial. If you do decide you like the software that's fantastic. This link actually allows me to receive a small commission on a sale at no additional cost to you. That being said. A real live person can always do a final edit much more accurately than a program can. You can clean up a lot of errors this way, but a real life reader and an experienced editor can then take that clean copy and polish it further. Always take it to the next step so that you can produce the best work you possibly can each time! 1. As a writer, I have to look at the big picture. I need long range goals that overarch the multiple short term ones I also have to focus on – it’s a marathon not a sprint. I’m learning that patience is not my strong suit. I want to do it all and I want to do it right now. 2. As a writer, I assumed that I just needed to write something of quality. As an avid long time reader my thought was that if I wrote something intriguing, interesting or truthful and insightful, someone would one day love it and ask to publish it for me. Um…wrong… lol! I literally had no idea how publishing worked and just assumed that a good quality product was all it would take. I was incredibly naïve. 3. Serious authors are spending time not just writing books but training themselves in a variety of activities! Marketing, growing social media platforms, engaging themselves in speaking opportunities and a myriad of other activities to get their books in people’s hands. It’s not just a write it and they will come world we live in. 4. Writers who have a career in writing spend years to be successful. This has been a tough lesson. I was hoping to be the exception, because I am exceptional and all. –little joke! The reality is that there is a lot of different things that go into what makes a successful writer and if I want to be at it long term I need to build a broad foundation. 5. I’ve learned during this year of writing that I really enjoy writing a wide variety of things. Let me write all the genres - Non Fiction, Devotionals, Short stories, Blogging and even copywriting. But the thing that I absolutely love and could lost in doing is by far Fiction. I love turning a story around in my mind and getting the parts in place to keep it interesting. SO.MUCH.FUN! BONUS: One more bonus thing I’ve learned. I thought I knew all the rules for grammar, but it turns out sometimes they change things. Like double spacing after a period is out…but that’s stuck in my mind for days. Thank goodness there’s a Word hack for fixing that!